The great surrealist auteur Luis Bu�uel began making Mexican films in 1946. 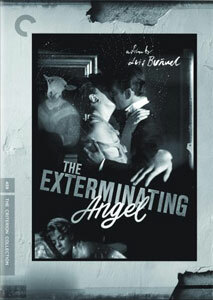 20 movies and nearly 20 years later, the director shot his final Mexican feature in 1962, The Exterminating Angel. This hilarious feature takes a simple, off-the-wall concept and makes it a deep, emotional (yet still funny throughout) tale of survival of the fittest. The Exterminating Angel brilliantly mirrors Bu�uel�s wonderful 1972 film The Discreet Charm of the Bourgeoisie. In that, the guests sit down to dinner but are always interrupted and never actually eat, while in Angel, a similar group of guests have no problem taking in some food and drink. Their initial problem is that they can�t leave the house, although that soon balloons into something far worse. The Criterion Collection brings Bu�uel�s amazing classic to DVD in the form of a 2 disc set that includes a great documentary on the second DVD. A wealthy socialite has planned a lavish party for his group of rich friends after a night at the theater. With the servants finished preparing the food and drinks, a few of them are in a hurry to leave. Once gone, only the butler (Claudio Brook) remains, and he is soon in the same strange predicament as the rest of the guests, stuck in a single room in the house. No matter how hard they try (albeit never actually physically attempting to leave), no one can cross that room�s threshold, let alone walk out any of the house�s main doors. No one either in the room or outside the house can figure out why these people are unable to leave or outsiders are unable to enter the house, but none of that will matter if the room�s new residents can�t learn to live together. It�s at around the 25-minute mark that we, the audience, realize that these people can�t leave the room they all slept in the night before. Part of Bu�uel�s genius is that he knows exactly when to let his characters in on their plight also. He could have led them on for another 15 minutes plus, but, being the master that he is, Bu�uel realized the perfect time to put both the characters and audience on the same page, so the perfect pace could be established. With the characters having been �trapped� inside for four days, Bu�uel takes things to another level by bringing his camera outside the house to show us how the rest of the world is reacting to this strange happening. It�s clear that there is nothing, physically stopping anyone from walking through the exterior gate to the house, but for some reason, they simply cannot cross this threshold. It�s difficult to think of a more maddening, compelling, and genius concept to center a movie around. Things get even crazier when a dismembered, yet alive, human hand appears in the room, crawling across the floor, over a table, and eventually on one of the guest�s body. Of course, like everything in his film, Bu�uel is asking us to question our belief as to whether what we are seeing on screen is actually happening or not. The surrealism, in lesser hands, could have gotten extremely ridiculous, but instead, this master of this art assures us that we�re in his more than capable hands. Nowhere is this more evident than in the scene late in the film when we see the �trapped� guests watch sheep and what I believe is a bear walk up and down the stairs just outside of their �prison.� Unfortunately for the curious sheep, they appear to get a bit too close to the guests, but, being the master that he is, Bu�uel fades to black just before we see the fates of these poor, possibly imaginary bundles of wool. It soon becomes clear what did happen to these animals, but this only lends another amazing layer to one of the most tantalizing webs ever woven on the silver screen. Image Transfer Review: Presented in its original full frame aspect ratio, the film has never looked better. While the restoration isn�t as impressive as that of Criterion�s recently released Simon of the Desert, it�s still obvious that a large amount of work went into this effort. We do have to deal with some print damage, but most of the dirt and grain are gone. Audio Transfer Review: The Spanish mono audio track is far from flashy, which isn�t surprising. The dialogue is crystal clear, though, and that�s really all we can ask from such a mix. Silvia Pinal � Interview with the actress. Arturo Ripstein � Interview with the filmmaker. Extras Review: The only extra on Disc 1 is the original trailer for The Exterminating Angel, but Disc 2 has more great supplements to offer. The Last Script: Remembering Luis Bu�uel was shot in 2008 by Gaizka Urresti and Javier Espada. This riveting 97-minute piece chronicles the journey made by scriptwriter Jean-Claude Carri�re and Juan Luis Bu�uel to the countries where the great director worked and were responsible for the surrealistic imagery that made up many of his films. There�s also 10 minutes of footage from an interview with the great actress, Silvia Pinal. During this January 2006 interview, Pinal talks about the three films that she made with Luis Bu�uel, which were also produced by her husband at the time, Gustave Alatriste. Another interview is offered on this disc, this time with filmmaker Arturo Ripstein. Also filmed in January 2006, he talks quite a bit about his on-set experiences during the shooting of The Exterminating Angel. The Criterion Collection has done a wonderful job adding classic Luis Bu�uel films to their library, with their editions of The Discreet Charm of the Bourgeoisie and Simon of the Desert among them. Add The Exterminating Angel to that list, as their 2-disc set for the film is up to par and then some with the rest of the studio�s phenomenal releases. The restored audio and video are great by themselves, but the additional 2nd disc of extras takes things to another level.